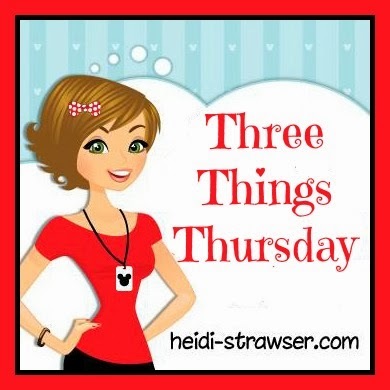 I am joining my friend Heidi today with Three Things Thursday, we would love for you to join along!! I am pretty open here on the blog and had to really think about what you may not already know, so I decided to go with family. 1. I have 6 brothers and sisters. I grew up in a large family, 5 girls and 2 boys. I cannot imagine growing up in a quiet household. My oldest sister was married and had her daughter before my youngest brother was born - so Robbie has literally been an uncle for his entire life. I am the youngest of the girls and my dad (Papa) called me Baby Girl until Ashley was born. My oldest brother was killed in an automobile accident in 1972 - his senior year of high school. We are in order Sue, Ricky, Faye, Sandra, Lisa, Donna, Robbie. Sue now lives in Stanley, NC (near Charlotte) and Lisa lives in Seattle, WA - the rest of us still live within an hour of our parents home. 2. I was born on my mother's birthday. My mom was born August 19, 1936 and I was born August 19, 1963. Everyone always thought it was great that we shared a birthday, me not so much. Don't get me wrong - I love my mother very much and wish she was still here for us to share it together. That being said. everyone needs a special day all their own. If you have kids with birthdays close together make sure you celebrate them separately. Trust me on this one. Mike, me Dakota & Ashley circa 2006 (ish). 3. My kids are 10 years apart. Ashley was born June 1987 and Dakota June 1997. Mike and I had agreed not to have kids when we got married (Ashley was 8). Dakota was very much a surprise baby. I would be lost without him, and he was definitely a gift from God. Ashley thought we were lying to her when we told her that I was pregnant, and she was like a second mommy to Dakota when he was little. She was a huge help in taking care of her little brother and she is a phenomenal mother to her own kids now. Mike and I are now the "end of the line" so to speak. We have both lost our parents and grandparents, and it's a big realization that you are truly the "adult" and you have no parent to go to when you need advice. If you still have your parents/grandparents hug them tight and tell them "Thanks & I love you." Thanks so much for linking up and joining the 3 Things Fun this week!